A high-design walkway is the perfect way to unite a modern addition with an existing abode. 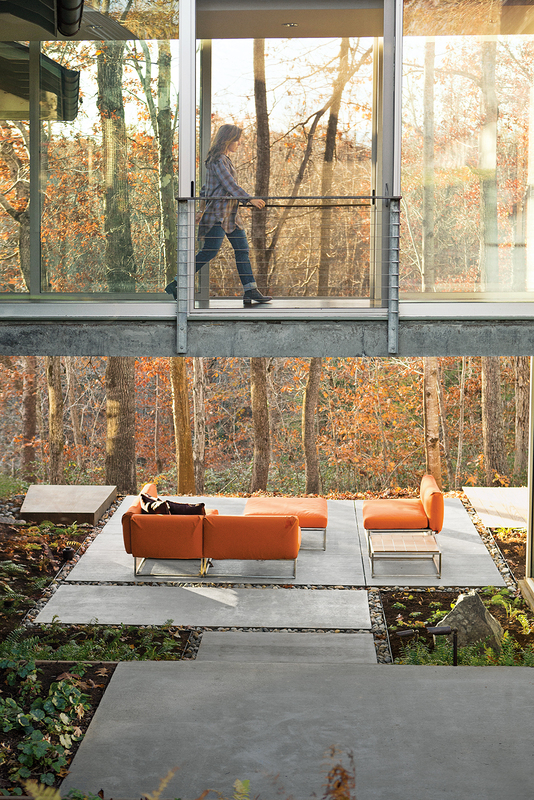 A renovated 1983 Virginia home was combined with a second volume, below the tree line, that connects to the main house with a glass bridge. Two steel-framed rectangular volumes form a creative home for two brothers in Austin. The buildings are connected by a glass-walled hallway that bridges a reflecting pool and water garden. A San Francisco beach house received a new addition designed to capitalize on views of the ocean. A frosted-glass bridge unites the original 1950s structure to the new addition, which is sheathed in Cor-ten steel panels. The late architect David Boone designed this Berkeley home in 1972. The house consists of two identical slant-roofed boxes: an office, kitchen, and living room in one; bedrooms in the other with a studio below. A glass walkway connects the two. A modern Austin addition is united with the renovated 1920s bungalow via a glass pavilion.